When nonprofits think about what they need to keep their organizations running, they often think of fundraising campaigns. But what if they could get the items they need donated just by flipping through a catalog? 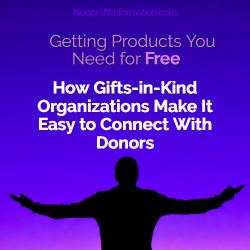 It sounds too easy, but that’s the idea behind gifts-in-kind organizations. These organizations act as a go-between between companies with excess inventory and nonprofits in need. Groups like social service organizations, schools and churches can all benefit from donations that range from office equipment and supplies to toys and clothing. How does it work? A qualified nonprofit pays a small annual fee to join a gifts-in-kind organization. Once the nonprofit becomes a member, it can request any of the donated items the gifts-in-kind organization has in stock at any time throughout the year. The nonprofit may make selections by browsing through the organization’s catalog of donated items or scrolling through an online list of inventory. Once the nonprofit places its order for the items it wants, the nonprofit then pays only for handling and processing fees incurred to ship the items. Who can join? You must be affiliated with a 501(c)(3) nonprofit organization, school or church to join a gifts-in-kind organization. This may include charities, community organizations, government institutions and health facilities, among others. What are the limitations? A member can request as many items as they want throughout the year. The only requirement is that they act in accordance with IRC section 170(e)(3). According to those guidelines, merchandise must go to care for the ill, needy or minors. It can be given directly to such qualified individuals served by an organization or used in the administration of the organization. The emphasis is on direct use—the items cannot be bartered, traded or sold. How much can I save? It depends on how many and what types of items you request. Members of NAEIR, a leading gifts-in-kind organization, have reported a wide range of savings. On the high end, one church reported receiving $2 million in donated merchandise in one year. (Those items mostly went to children overseas through the church’s ministry.) On a smaller scale, a school that hosted a family arts and crafts event received enough paintbrushes, ornament shapes, tablecloths, stickers and pipe cleaners for all 341 participating students. On average, NAEIR members receive about $18,000 worth of merchandise a year. To boost their savings even more, some members opt to drive to the NAEIR warehouse in Illinois to pick up and transport items on their own. What types of items are available? Gifts-in-kind organizations may have printers, pens, art supplies, toys, clothing, tools, health and beauty products, cleaning supplies and more. While available stock will vary throughout the year, nonprofits will find a wide variety of items on hand. What types of companies donate? Both large corporations and small business donate to gifts-in-kind organizations. There are no restrictions on the size of donations so even mom-and-pop stores can make donations. Items may come from large companies like Hallmark, Microsoft, Stanley Tools, 3M Rubbermaid, Reebok, Gillette, Xerox and SC Johnson as well as small businesses, like a family-owned comic book store. Why do companies donate? There are all kinds of reasons they donate. A few include to promote good will, to make room in their warehouses for new stock, to keep their products out of landfills and to take advantage of tax deductions that are often more advantageous than liquidating or discounting unsold merchandise. Since companies pay only to ship their goods to a gifts-in-kind warehouse, donating to a gifts-in-kind organization can be more cost-efficient than designating employees to spend time seeking out prospective charities for their donations. How can it work for you? Think about the larger items your nonprofit wants to replace or items that you need on an ongoing or monthly basis. Replacing any of those items with donations from a gifts-in-kind organization could save you money—and help you keep perfectly good merchandise from clogging up landfills. The one downside is that you won’t only have your pick of brands. You’ll have to choose among donated items. But just choosing a few items from a gifts-in-kind organization, or using it to provide supplies for one event, could save you money as well as time. And if you add in the manpower hours you would need to collect a similar array of donated items—or the cash to pay for them—the savings grows. In an environment where cost-cutting is key, a gifts-in-kind membership is definitely worth considering.